HTC has designed latest Smartphone of Desire series for all its hand-set buyers of the World. Now it has introduced HTC Desire 830 Smartphone with latest Android Marshmallow system. It is also providing reliable Octa-core processor feature of 1.3 GHz Cortex-A53 with Media-tek MT6753. It is slim body structure Smartphone with light weight for keeping it. HTC has provided stylish look with attractive color combination and display screen of this hand-set also gives crystal look with 16M colors option. It is biggest HTC Smartphone launched of year 2016 and buyers are attracting for buying this mobile phone for using. Dual-SIM option is also available in this hand-set and it is providing 3GB RAM with 32 GB built-in memory feature. External micro-SD supported is included in this product up to 128 GB along with dedicated slot. It also gives option for using 3G and 4G internet services in this mobile phone and users can use all latest facilities through this Smartphone without getting hanging issue. Camera feature is also phenomenal in Desire 830 and it is providing 13.0 mega pixels rear camera option with OIS latest feature and 4.0 mega pixels front camera facility. It is complete Smartphone product with all latest technologies and users can do multiple working by using this cellular phone. 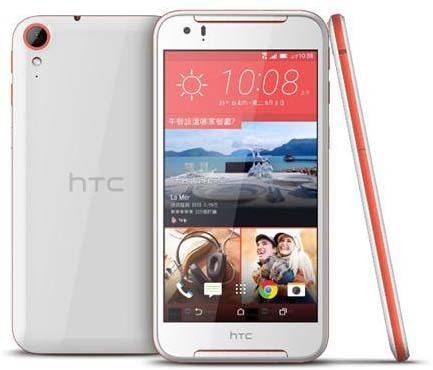 Get the specification details of this HTC Smartphone from the below. Processor:Octa-core 1.3 GHz Cortex-A53 and Media-tek MT6753. Front Camera: 4.0 Mega Pixels (Touch focus). Display Colors: 16M Colors and Super LCD capacitive display touchscreen. Bluetooth v4.1, WI-FI Direct, A2DP WI-FI Hotspot, Micro USB v2.0, GPRS, WLAN and EDGE. Audio: FM-Radio, MP3, MP4, 3.5mm audio jack, WAV Player, AAC Player and Other multimedia players. Ringtones: Polyphonic ringtones, MP3, Downloadable, WAV Files and Sound-recorded. Other Features: GPS Supported, A-GPS Supported, Multi-touch display option, Calendar, Stereo Speaker phone, Google search, Glonass supported, Photo/Video editor, Compass sensor feature and Document viewer. Latest Features: HTC Sense, Front Boom sound speakers, Active noise cancellation via MIC, External Micro SD supported up to 128GB, Dedicated slot, Plastic build design, Ultra-pixel with f/2.0 front camera option, Accelerometer sensor and proximity sensor. Available Colors: Blue with white and Red with white. You may also like it: HTC 626S Smartphone.